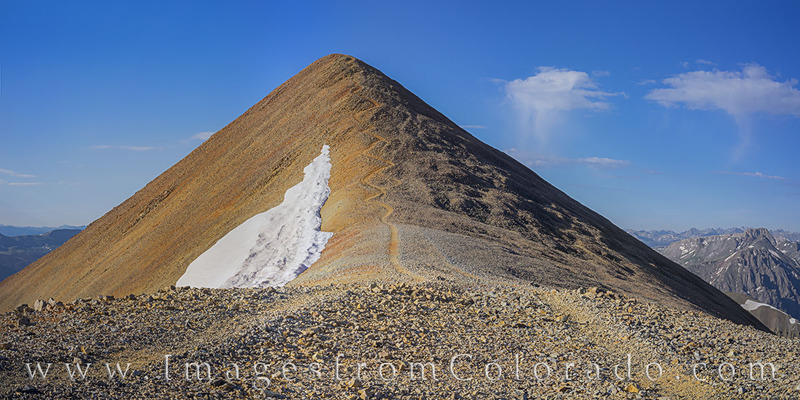 This image shows the Silver Creek Trail trail as it leads up to the summit of Redcloud peak at 14,034 feet. Located near beautiful Lake City, Colorado, this peak, along with its sister peak, Sunshine, is known for the red-colored summits caused by iron deposits in the rock. To bag both 14ers in a single hike, you’ll need to cover 12+ miles and 4,800’, but the views of the San Juan Mountains at the summit are beautiful. Photo © copyright by Rob Greebon.